Srimad Baladeva Vidyabhusana Prabhu was a pure devotee of the highest order, who cared for nothing but the service of the Lord. He didn't have a spot of desire for name and fame. He was the composer of many scriptures which are as priceless as precious gems, for the ultimate benefit of all those who have taken human birth. The exact location of his birth, the names of his mother and father, and their family tree is not known. The exact circumstances of his birth and childhood are, therefore, unknown. Still, some are of the opinion that he took birth in a place called Baleshvara, a village neighboring Remuna, in the early part of the 18th century A.D, as the son of a vaisya, an agriculturist. At an early age he became learned in Sanskirt grammar, poetry, rhetoric, and logic. After becoming expert in all these subjects, he began wandering to different places of pilgrimage. After wandering about in this way for some time, and after visiting many holy places, he happened to stay at a temple of the Tattvavadi followers of Sri Madhvacharya. There, he became fluent in his understanding of the tattvavada-siddhanta, that is, the philosophical and theological conclusions of the followers of Madhva. After this, he took sannyasa, and preached the tattvavada-siddhanta very vigourously throughout the length and breadth of India. As he wandered from one place to the next, he gradually came to Jagannatha Puri. There he remained and preached for a few days. At that time, he chanced to meet one of the foremost disciples of Sri Rasikananda Deva, Pandit Sri Radha-Damodara, with whom he discussed devotional principles. At that time, Srimad Radha-Damodara deva Goswami instructed Baladeva on the subject of Sri Gourasundara's pastimes of mercy and His teachings on Gaudiya Vaishanva siddhanta to Sarvabhauma Bhattacharya. After hearing the divine wisdom spoken by Sri Radha-Damodara Goswami, Baladeva's heart was deeply moved. After a few days of hearing from him, he accepted initiation into the Radha-Krishna mantra, and began studying the Sat-Sandarbhas of Jiva Goswami at the holy feet of his gurudeva, Radha-Damodara Goswami. After a short time, Baladeva became expert in the Gaudiya Vaishanva siddhanta. After staying with Radha-Damodara Goswami for some time, he was ordered to further his studies in Gaudiya Vaishnavism by going to Vrindavan and taking shelter at the holy feet of Vishvanatha Cakravarti Thakura. After first visiting Nabadwipa, he soon arrived in Vrindavan. Sri Visvanatha Chakravarti Thakur (Sri Harivallabha dasa), was very happy to see Baladeva's submission, modesty, learning, and renunciation. From that day forward, for some time, he kept Baladeva by his side and taught him the acintya-bheda-abheda philosophy of Sri Chaitanya and many other important siddhantas related to the Gaudiya Vaishnava conception of Krishna-bhakti. From this point on, Sri Baladeva's life and soul was fully dedicated to the theistic conception of the Gaudiya Sampradaya. His mind was fixed on this, and with one-pointed determination, he now began preaching this line to the exclusion of all others. One day, in Jaipur, in the royal court, the Ramanuja sampradaya began arguing a case in connection with the Gaudiya sampradaya. They informed the king that the Gaudiya sampradaya had no commentary on the most important revealed scripture of Vedic religion - Vedanta; therefore they had no siddhanta and no real sampradaya, or school. As a consequence they should give up their service of the deities of Govinda and Gopinatha, and entrust with those who were bona fide members of a genuine sampradaya. At that time, the king of Jaipura was a follower of the Gaudiya sampradaya. He immediately sent word of the controversy by messenger to Vishvanatha Cakravarti Thakur in Vrindavan, wanting to know if the Gaudiya sampradaya actually did have any commentary on the Vedanta. If there was, the king wanted that the commentary be sent immediately to Jaipur to satisfy the scrutiny of the pandits from the Ramanuja Sampradaya. At this time, Sri Vishvanatha Chakravarti was very old and infirm. It was impossible for him to make the arduous journey to Jaipur. He sent his student and disciple, Sri Baladeva, in his place. Baladeva Vidyabhusana was an expert scholar in all the important scriptures. In the midst of a huge assembly of pandits from the Ramanuja sampradaya, Baladeva challenged them all to argue with him in scholarly debate. A long, and hard-fought debate took place, with tumultuous arguing from the Ramanuja school. Still, none of them could stand before his conclusive statements, keen scholarship, and penetrating intellect. Baladeva argued that the founder of the Gaudiya Sampradaya, Sri Chaitanya Mahaprabhu established the Srimad-Bhagavatam as the topmost commentary on Vedanta. The Bhagavatam itself claims that it is bhashyanam brahma-sutranam, the natural commentary on Vedanta. This is confirmed on the basis of evidence given by Jiva Goswami in his Sat Sandarbha. Therefore, the Gaudiya sampradaya has chosen to accept Srimad-Bhagavatam as the original commentary on Vedanta, and sees no need for a separate commentary. At that point, the pandits from the Ramanuja sampradaya shouted: "He admits that there is no commentary! They have no commentary!" Having no other recourse, Sri Baladeva Vidyabhusana promised to show them the Gaudiya commentary on Vedanta within a few days. The pandits were astonished to think that such a thing existed. They were suspicious that this might be some kind of trick, but were silenced for the time being. Very troubled within his mind, Sri Baladeva Vidyabhusana went to the temple of Sri Govinda, the deity of Rupa Goswami. After offering his eightfold obeisances before the deity, he related everything that had taken place. That night in a dream, Sri Govinda told him, "You must compose the commentary. That commentary will be personally sanctioned by me. No one will be able to find any fault in it." Seeing this in his dream, Baladeva became very happy, and his heart was full of strength, ready for the task at hand. After this, he meditated on the lotus feet of Govinda and began writing his commentary. Within a few days it was completed. This commentary became known as the Govinda Bhashya commentary on Vedanta. In an addendum appended to the Govinda Bhashya, after it was published, Sri Baladeva has written, 'vidyarupam bhushanam ye pradaya, khatim nitye teno yo mamudarah, Sri govinda-svapna-nirdishtha bhashye, radhabandhurangah sa jiyat.' "May Sri Govinda be all glorious. By his mercy, he revealed this commentary to me in a dream. The commentary revealed by him is especially appreciated by the highly learned, and as a result of this I have been given the name Vidyabhushana, but it is Sri Govinda who deserves all credit. May that Sri Govinda who is the most dear life and soul of Sri Radhika, be all-victorious." With the Govinda Bhashya commentary in hand, Baladeva Vidyabhushana arrived at the assembly hall of the king, where the pandits were waiting for him. When he showed them his commentary, they were speechless. The Gaudiya sampradaya was proclaimed victorious. The king and all the Gaudiya Vaishnavas were supremely happy. At that time the pandits gave Sri Baladeva the name Vidyabhushana, or one whose ornament is knowledge, in honor of his great scholarship. The year was 1628, Shaka era. From the day forward, the king of Jaipur decreed, everyone would attend the aroti of Sri Govinda, the deity beloved by the Gaudiya Vaishnavas, who was ultimately responsible for such a wonderful commentary on Vedanta. 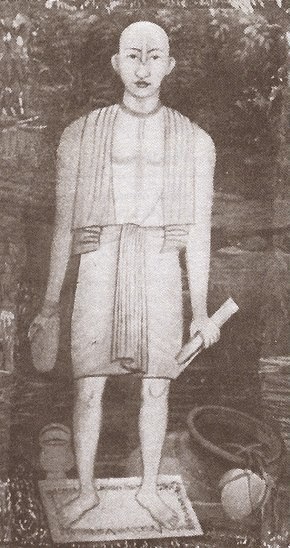 The Ramanuja pandits, falling under the influence of Sri Baladeva Vidyabhusana, accepted him as their acharya and wanted to become his disciples. With great humility, Baladeva Vidyabhushana refused, explaining that there are four sampradayas, among which the Sri Sampradaya is a genuine school that preaches servitude to God as the best religious process. By advancing the views of the Gaudiya sampradaya, he meant no disrespect to the Sri sampradaya. To insult the Sri sampradaya would be a great offense, he said. Sripad Baladeva Vidyabhushana returned from Jaipur to Vrindavana carrying the message of his victory. Upon returning, he submitted to the lotus feet of Sri Vishvanatha Chakravarti Thakura and told him the news. All the visiting Vaishnavas and the residents of Vrindavan were delighted and Vishvanatha Chakravarti Thakura bestowed his blessings upon Baladeva Vidyabhusana. After this, Baladeva Vidyabhusana began writing a commentary on the Sat Sandarbha. Soon Vishvanatha Chakravarti Thakura passed away, and the Vaishnava community felt as if a great beacon of divine light had been extinguished. At that time, Sri Baladeva Vidyabhusana became regarded among the Vaishnava community as the keeper of the flame, the leader among those who understood the teachings of Sri Chaitanya. "The one absolute truth has two categories: the named (Krishna) and the name (Om). Parameshvara, Sri Krishna, the absolute person is the named; pranava, or omkara (Om) is the name. The named, or Parameshvara Sri Krishna, reveals himself in different forms as Matsya, Kurma, and many other forms. In the same way the name of the Supreme Lord expands into many different forms; such as the transcendental syllable Om, the gayatri mantram, and the Vedas themselves. There is no limit to the Supreme Personality of Godhead; he has no beginning and no end. As a consequence, his glorification is also eternal. He appears within this material world, stays for some time, and again disappears according to his own sweet will." Baladev explains the potency of Godhead in his Siddhanta-darpana: "The Lord has three potencies - thinking (jnana) feeling (kriya) and willing (bala). Through these three potencies he causes the material creation to come into being. The rays of consciousness emanating from him - the jiva souls - are his separated parts and parcels. By his thinking, feeling, and willing, they too come into being. The Vedas are spoken by the Lord, who is all-perfect. The Vedas are therefore free from the four defects of material existence: error, cheating, illusion, and imperfect perception. And so, the Vedas are the perfect form of evidence for understanding the Supreme Truth. The Vedas glorify Krishna as the absolute truth. The Puranas and Itihasas are as good as the Vedas. They too glorify Krishna as the absolute truth." tadevam sarvatah shreishtha shabdasya sthite tattvanirnayakastu shrotilakshana eva na tvarshalakshanopi. "There are different ways of knowing what is truth: pratyaskha (direct perception), anuman (inference, hypothesis, and deduction), shabda (the words of the authorities), arthapati (interpretation), anupalabdhi (negative inference), sambhava (the laws of probability) and aitihya (history). 1) Krishna, who is known as Hari is the Supreme Lord, the Absolute. 2) That Supreme Lord may be known through the Vedas. 3) The material world is real. 4) The jivas, or souls, are different from the Supreme Lord. 5) The jivas are by nature servants of the Supreme Lord. 6) There are two categories of jivas: liberated and illusioned. 7) Liberation means attaining the lotus feet of Krishna, that is, entering into an eternal relationship of service to the Supreme Lord. 8) Pure devotional service is the cause of this relationship. 9) The truth may be known through direct perception, inference and Vedic authority. These very principles were taught by Sri Chaitanya Mahaprabhu." According to Baladeva there are five categories of tattvas or truths which constitute reality: ishvara, God; jiva, soul; prakriti, matter; kala, time; and karma, action. Ishvara or God, is the greatest. He is all-knowing, he is the utmost realization of transcendental bliss, and his very nature is ecstasy. He is full in all qualities and is the absolute person. He is the master of everything and is eternally free from birth and death. He is the master of all the gods headed by Brahma and Shiva. He is the supreme husband, the Lord of lords, and the Supreme Person, the worthiest of receiving prayers. He alone remains as the absolute truth even after this material world (which is his separated material energy) is destroyed along with all the demigods such as Brahma, Shiva, and Indra. Baladeva further explains that Krishna has three energies, parashakti, kshetrajna-shakti, and maya-shakti. Parashakti means svarupa-shakti or the Lord's internal potency. Kshetrajna-shakti means jiva-shakti or the living beings, and maya-shakti means the Lord's external potency, his potency for keeping the souls in illusion. This explanation is on the basis of the Vishnu Purana. He goes on to explain that there is no difference between the body and soul of God. They are one and the same. As Krishna, the Supreme Lord has two hands, he plays a flute, he has a transcendental form of eternity, knowledge and bliss, and he is known by the names Govinda and Gopal. Lakshmidevi is nondifferent from Him, in that he is the Supreme Energetic and She is His Supreme Energy. (sei jaganmata lakshmi vishnur anapayini shakti) This confirmed throughout the shastra. Whatever form the lord appears in, there is a corresponding Lakshmi form who acts as his eternal consort. When the Lord appears as a god, Lakshmi appears as a goddess. When the Lord advents as an ordinary human being, Lakshmi also descends upon this earth as an ordinary human being. "Of all the manifestations of Lakshmidevi, Srimati Radharani is the Supreme Goddess, just as amongst so many avatars of Godhead, Krishna is the supreme Personality of Godhead." This is confirmed in the Brihad-Gautamiya Tantra,which states, "Sri Radhika is the Supreme Goddess. Her very nature is Krishna, for her very existence is permeated by Krishna. Therefore she is known as Krishnamayi or one who is full of Krishna. She is known as Paradevata, for she is the Supreme Goddess. All other goddesses are subordinate to her. She is the Supreme Lakshmi and her transcendental effulgence surpasses all conceptions of brilliance. She is the supreme enchantress, for she enchants Krishna Himself, who is capable of charming millions of cupids." Baladeva cites Shaunaka Muni who says in Srimad-Bhagavatam that of all the avatars, expansions of Godhead and Personalities of Godhead, Krishna is the Supreme Personality of Godhead. The worship of Krishna, must therefore be regarded as the highest form of worship. "It is the constitutional nature of the soul to be a servant of Bhagavan Sri Krishna. It is the version of the Padma-Purana that the soul is an eternal servant of Hari, and has no other genuine position." By surrender to the lotus feet of a spiritual master who is a devotee of Krishna, one attain Krishna-bhakti by the guru's mercy. Upon attaining Krishna-bhakti one gets Krishna Himself. "Having been deputed to do so by my gurudeva, the brahmana named Sri Radha-Damodara Goswami, I have compiled this commentary on the Vedanta known as Vedanta-syamantaka for the sake of Srimati Radharani's pleasure. This commentary is a summary of the important points of Vedanta. May it be pleasing to Sri Radhika." as well as commentaries on: Vishnu-Sahasra-nama, Srimad-Bhagavatam (Vaishnava-nandini-tika), Jiva Goswami's Tattva-Sandarbha, Rupa Goswami's Stavamala, Nata-chandrika, Jayadeva Goswami's Chandraloka, his own Sahitya Kaumudi, Laghu-bhagavatamrita, Nataka-Chandrika, and Shyamananda Shataka. Sri Baladeva Vidyabhusana disappeared in the Christian year 1768.